The Community Health & Prevention team works in partnership with the community to identify health needs, develop interventions to address health needs, and participate in community events by providing health education and presentations. The Team strives to be leaders for health promotion and disease prevention in the communities it serves. Community Health and Prevention staff develop grant proposals to address health priorities for the health district. The Team is an active partner with community organizations and coalitions who work towards improving health for citizens of the health district. This team also trains community partners on effective strategies to improve public health. Crater Health District monitors health trends in the community to identify the greatest health needs. The District then engages the community in several ways to address those health needs and is currently involved with several projects. The Crater Health District provides health education in a variety of settings to include community events, churches, worksites and schools. This includes reproductive health education in Crater middle and high schools. The District strives to honor community requests for health department participation at speaking engagements, trainings, health fairs, forums, and for health-related literature/brochures. Please use the “Request for Outreach” link below to request any of these services. Please note we cannot guarantee all requests due to staff availability and timeliness of request but we will do our best to accommodate your request. Chronic disease prevention is a primary focus for the Crater Health District. 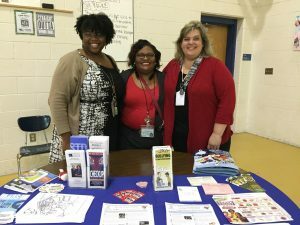 Currently, the district is focused on prevention of chronic diseases through a variety of projects which include obesity prevention by promoting healthy eating and active living, health equity and health policy, worksite wellness, Crater Healthy Corner Store Initiative, and Crater Diabetes Prevention Program Network. The Healthy Living and Learning Center (HLLC) is a supportive, literacy-conscious environment where health information and resources such as books, brochures, videos, referrals and online services are shared with community members. HLLC provides citizens with access to health information and connections to existing health resources available in the community in a readily available location. The Center provides these services at its location in the Petersburg Public Library and through mobile outreach efforts. HLLC is a partnership between Crater Health District, the Petersburg Public Library and VCU Massey Cancer Center. Lead is a very toxic metal that was used for many years in products found in and around homes. Children exposed to lead may experience negative health effects, depending on how much lead they were exposed to. Children six years of age and younger who are at risk of lead poisoning are referred to their primary care provider for lead testing. Trained health educators offer case management, preliminary home assessment, and educational services to families of children with elevated blood lead levels.